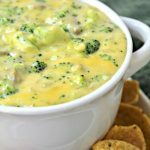 Warm cheesy broccoli dip bursting with flavor! Perfect for parties! In a skillet, melt butter and saute onions and mushrooms. Mix in remaining ingredients and stir until cheese is melted. Place in a serving bowl or keep warm in a crock pot on warm.